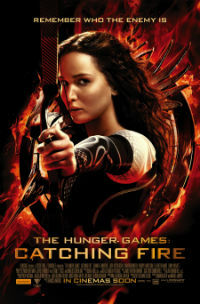 If you ignore that essentially the idea of “The Hunger Games” is stolen from Kinji Fukasaku’s Battle Royale, the underlying plot of these films is actually one of the most original and daring to come from Hollywood in some time. Catching Fire proves this franchise is much more than your average popcorn film. Considering it was supposed to be the studio’s answer to Twilight and Harry Potter, their interpretation of a futuristic socio-economic uprising is actually quite bold when you think about it. Director Francis Lawrence has done a fantastic job of turning this potentially mind-numbing franchise into something of substance. Apart from a couple of really cliché moments and cringe-worthy pieces of dialogue, Catching Fire is well written, well directed and well acted by all involved. It’s far superior to the original on every account. It could quite possibly be the addition of Philip Seymour Hoffman, or the fact that Jennifer Lawrence gets better with everything she’s in, but it seems the entire cast are taking their roles more serious in this film. In the first, most of the cast seemed to be taking the piss. It definitely seemed like they weren’t taking their roles or the film very seriously. Here, Josh Hutcherson, Woody Harrelson and Elizabeth Banks have evolved into genuine characters. Stanley Tucci is the only person who seems to be more ridiculous, but it works well for his character. Even their depiction of the Capitol is more tongue-in-cheek than cartoonish, and it feels like more of a statement than a joke. Unfortunately, none of this changes the fact that Catching Fire is ridiculously long and the set up for the actual games goes for way too long. Half the crap about their tour at the start could have been cut. Because I haven’t actually read the books, I’ve got no idea what’s going to happen in the third – and after watching this I am a lot more interested than I first thought. For that, I really have to congratulate Francis Lawrence and his crew, because my interest in these films has completely taken me by surprise.